Neue Deutsche Spielkarte Nr.1 with full-length figurative designs and non-standard German suit symbols, conceived by Dr. Timon Schroeter, illustrated by Jacob Hirsch & Martin Lämmel, and printed lithographically by J. G. Fritzsche, Leipzig, 1883. The four suits represent the four most important human characteristics: Acorns = force; Ivy = loyalty; Turnips = diligence and Sunflowers = wisdom. The king of acorns depicts Charlemagne or Charles the Great with his coat of arms on the deuce. 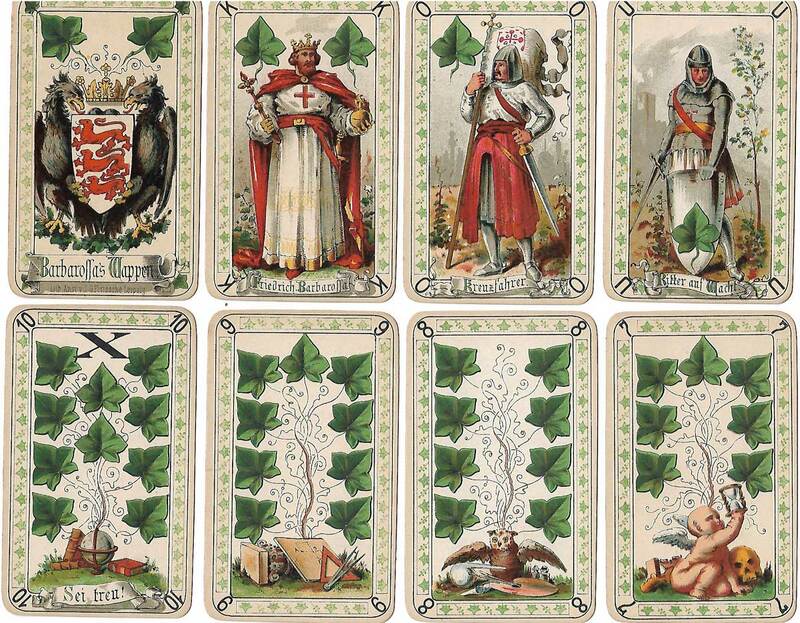 The king of ivy leaves depicts Frederick Barbarossa who was the Holy Roman Emperor from 1155 until his death in 1190. The king of sunflowers depicts Rudolf of Habsburg (1218–1291) and the king of turnips is Maximilian I, Holy Roman Emperor from 1493-1519. The obers and unters depict attendant heralds or footmen. 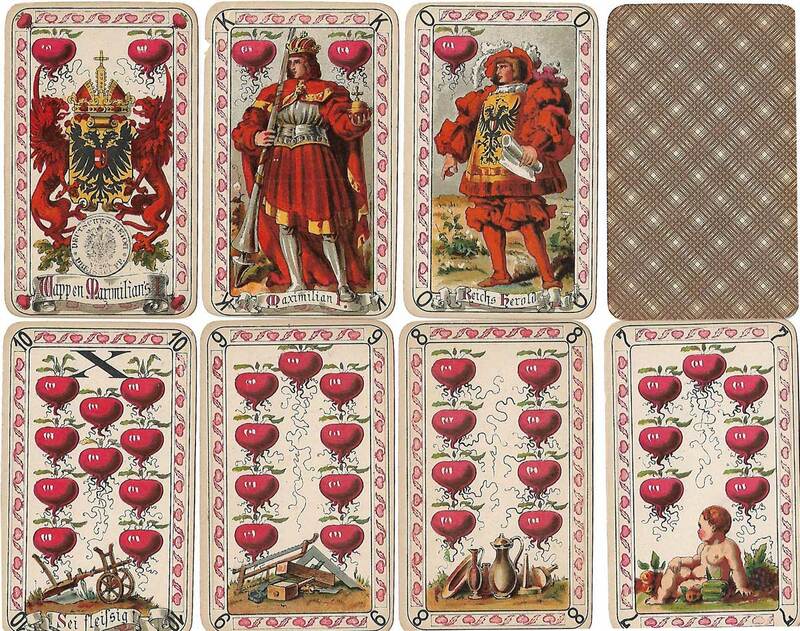 The numeral cards feature attractive vignettes at the bottom showing allegories of industry, craft, wealth, etc. 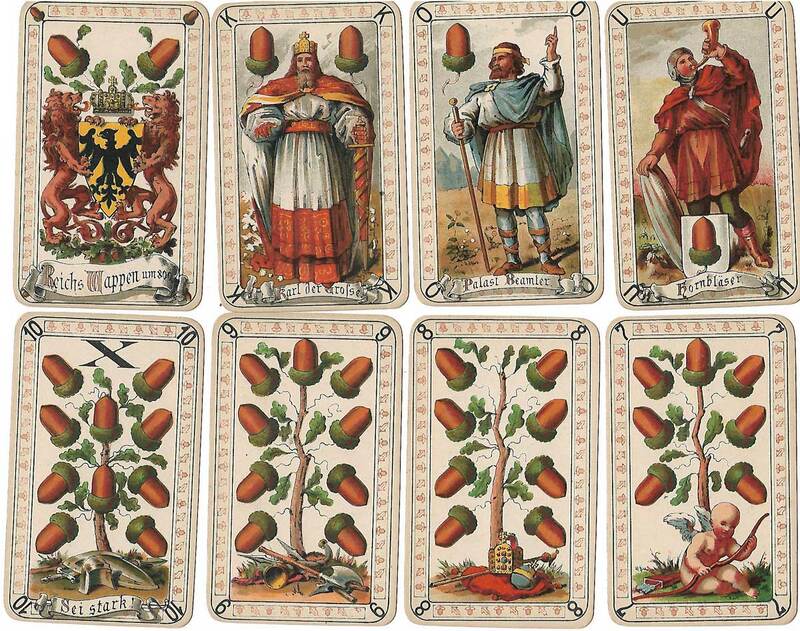 Above: Neue Deutsche Spielkarte Nr.1 (New German playing cards) conceived by Dr. Timon Schroeter, designed by Jacob Hirsch & Martin Lämmel, and printed by J. G. Fritzsche, Leipzig, 1883. 32 or 36 cards. There are several variants of the deck. Some have Queens instead of Obers, some are without index signs and some are without ornamental borders. The initials T.S. are on the nine of Sunflowers and J.H. 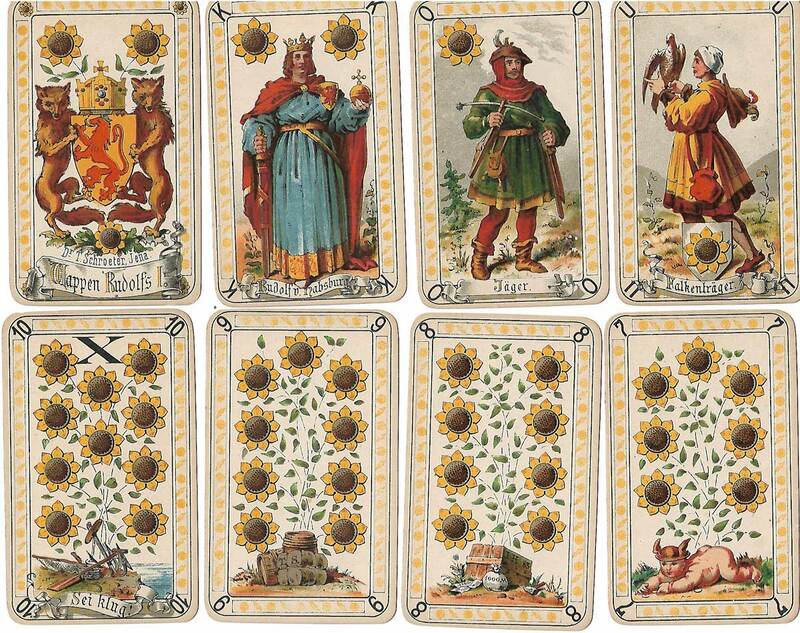 are on the eight of Sunflowers along with “83”, no doubt referring to the year of the deck’s creation.